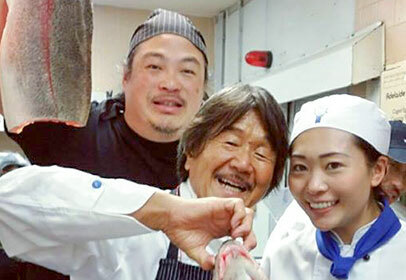 An unforgettable “Iron Chef” experience! Sakai In SA by Ginza Miyako were charity black-tie dinners that were held in Adelaide on the 13th and 14th October 2015. A 7 course degustation dinner by the legendary Chef Hiroyuki Sakai, Chef Ikuei Arakane and Chef Mark Normoyle, all of whom wear the title “Iron Chef”, also joined by Executive Pastry Chef Pierrick Boyer from Le Petit Gateau and Head Chef Kazuki Ushiro from Ginza Miyako. The dinner also showcased matching Australian wines presented by Sommerlier Masahiko Iga. Le Cordon Bleu was contacted by the organisers of the event and our students were offered the incredible opportunity to volunteer in the kitchen and front of house, providing them with an invaluable experience. Feedback from the event was that our students were a great help. Well done to you all! A lot of fun was had, much was learnt, and a memorable experience to cherish forever.